The pools at Disney’s Art of Animation Resort will see quick refurbishments. The Big Blue Pool will be closed from November 17 – 19; the Flipping Fins Pool will be closed from November 20 and 21; and the Cozy Cone Pool will be closed from November 24 – 26. 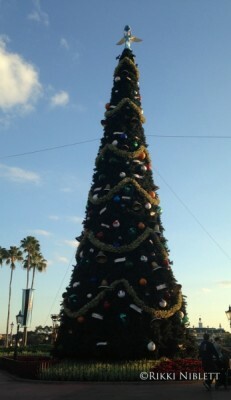 The Festival of the Season has officially kicked off at Downtown Disney. Guests can shop and explore, plus they have the chance to meet Santa in his chalet from now until December 24. After December 24 until December 29, guests will get to meet Santa Goofy! If you love the “Holidays Around the World” celebration at Epcot, this year there will be three new performances taking place. They will include “Fiesta de Navidad” in Mexico, which will feature dancers and mariachis, who are there to celebrate the holiday customs of Mexico. In Morocco, a storyteller invites guests to join her on a journey to experience the festivals, holiday traditions, and celebrations of the country. And the China pavilion will see the Chinese Lion Dance, to honor of major holidays-the Lunar New Year and Lantern Festival. France Pavilion: bûche de noël au chocolate (chocolate cake shaped like a log) from Les Halles Boulangerie Patisserie and gingerbread ice cream from L’Artisan des Glaces. For reservations call 407-WDW-DINE. This dining experience is taking place because Cinderella’s Royal Table will be closed for a two month refurbishment during roughly the same time period. One for the Money. . . Two for the show. . . .
Mmmm…I just want to take a trip down so I can eat my way around the World Showcase. All of that sounds divine!